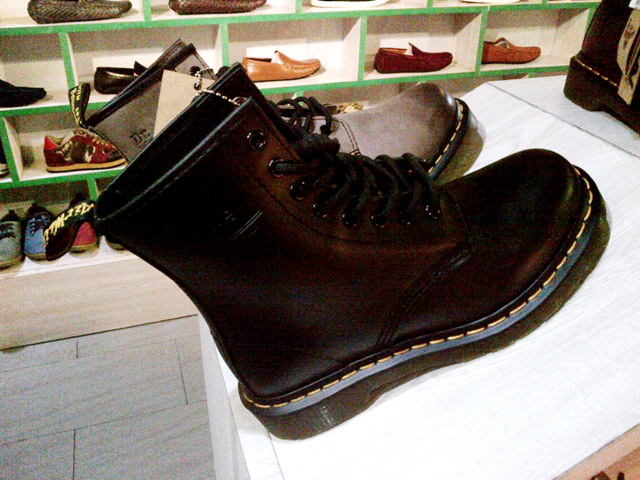 A Doc Martens post, yay! 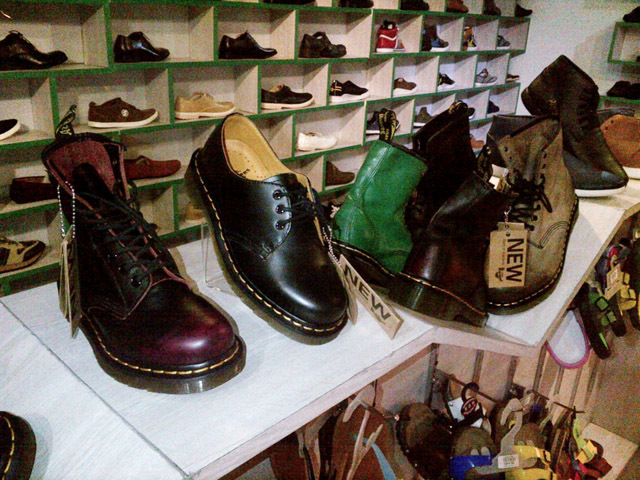 It has been a while since I remotely wrote something about Doc Martens. I was cheating with Red Wing lately, and I have used my two pairs more than my other DMs. Anyway, I recalled something I have noticed last Sunday on my usual route back to Makati. I normally drop by Farmers Market Plaza to access the MRT, when one of the shops caught my eye. The black and yellow Air Wair tab was unmistakable even from a distance, that I even had to double back and squint my eyes from outside the store to discern whether or not it was not a shoe mirage. I went straight to the black 8-hole near the entrance and the salesperson immediately approached me. My first task was to look for the price. It was Php 3,999 (slashed from Php 7,995), regardless of the size and color, all the 8-holes were priced the same. The next thing to do was hold the shoe. The pair was significantly lighter than any of the Doc Martens I own that I thought “Is this for real?”. The leather was about half as thick and I can no longer think of anything different other than that. Of course I had to paraphrase my internal question when I asked the salesperson because asking somebody outright whether something is authentic or not is plain rude. I can’t exactly remember the response but I was then told that they are a) authentic Doc Martens and assembled in China, or b) authentic materials assembled in China. I then asked permission under the pretense that I had to think it over. Sorry for the low quality photos because I just used my phone camera. I would have wanted to use my digicam, which was fortunately inside my bag. However, I’d look ridiculous trying to look for it inside just to take photos. There’s obviously a big difference between an authentic pair assembled in China, and being made of authentic materials assembled in China. Not to demean China as it is obviously the factory of the world, and they are just working on their competitive advantage in international trade (i.e. surplus labor). Also, a lot of luxury brands are outsourcing production in China for profitability and it does not exempt other middle-tier brands from capitalizing on that profot promise. So what’s exactly my point? Well, I just realized that I have no idea what a Made in China/Made in Thailand Doc Martens look like or feel like because all of my vintage pairs were Made in England (usually seen on the sole). I can’t personally verify whether these shoes are the real deal, and I have yet to visit the store carrying Doc Martens in Bonifacio Global City. I kept tab of the store’s name but two days after, I have already forgotten it. I tried looking for information online about its name but it wasn’t even listed in New Farmers Plaza’s store directory. All I know is that it has a fancy pun/wordplay on ‘shoe’ and that’s about it. Anyway, it is always important to do your homework when buying anything, and thank God we already have Google and internet to help us find some! If the shoe doesn’t fit: the Doc Martens sizing fail. Breaking in these Doc Martens: ACCOMPLISHED! 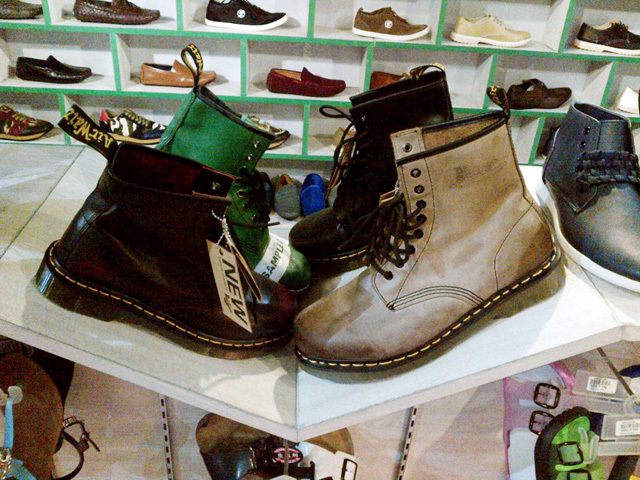 How hard is it to find Doc Martens in the Philippines: HOLY GRAIL!